← Lucky winner of the SXSW Talking Photo Booth drawing! The only things certain in life are death, taxes, and … Timeline. Unlike the former two certainties, Timeline is something to be excited about. It’s going to be great for you and your business or organization. Timeline and big, beautiful photos were made to go together. In the next few weeks, In the next week Fotobabble will be releasing the Timeline version of our Facebook App, which will leverage Facebook Timeline and transform your profile from run-of-the-mill to captivating and memorable. Stay tuned for the release. 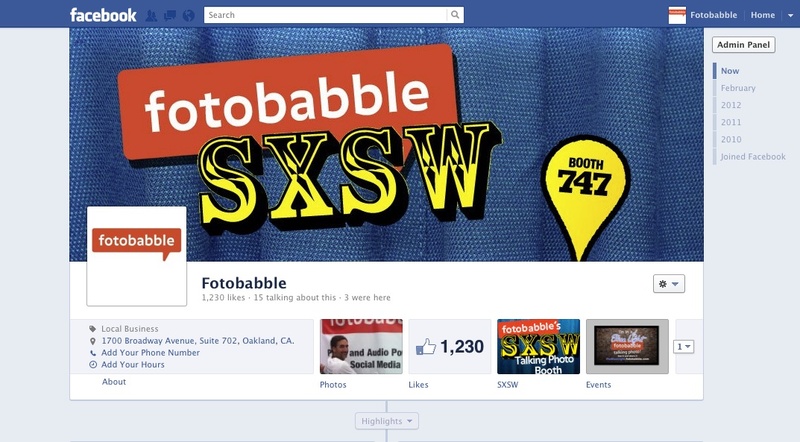 Until then, ask us how you can use Fotobabble with Timeline to make a Facebook page that makes your brand shine. Feel free to contact us with questions: info@fotobabble.com.